A newly signed agreement between Elmhurst College and Triton College will enable business and accounting students from Triton to easily transfer credits to Elmhurst, where they can complete their bachelor’s degree. Under the agreement, Elmhurst College will guarantee acceptance of Triton College students with an associate of arts degree; they may then transfer up to 70 credits hours to Elmhurst beginning in the 2018 Fall Term. This includes a required 25 semester hours of accounting or business administration course credits, which can be applied toward the bachelor’s degree requirements in those programs. 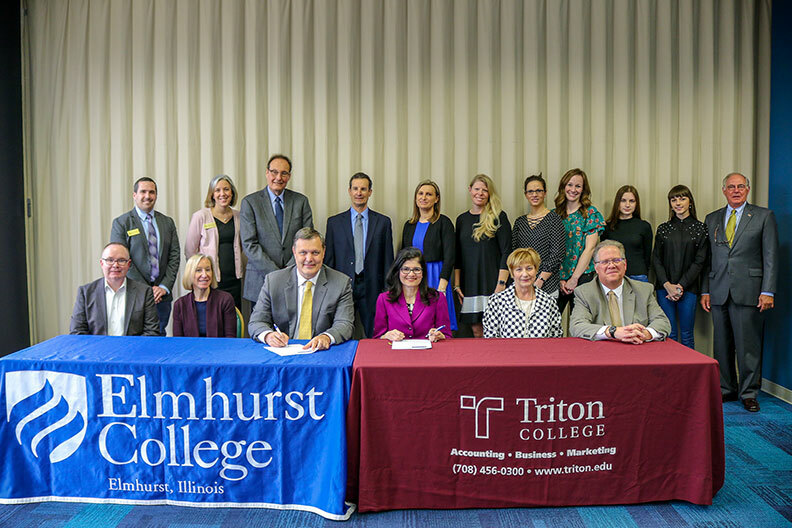 Leaders from Elmhurst and Triton met at Triton’s River Grove campus on Wednesday, April 11, to sign the agreement, also known as a 2+2 articulation agreement because it enables students to earn both an associate and bachelor’s degree in four years. The first two years of a student’s education are spent at Triton, the final two at Elmhurst. Students must meet the admission requirements of both institutions, and both will provide advisors to assist each student in planning their program of study. “It’s really about reaching out to students and finding out their needs, and how we as administrators and faculty members can provide opportunities for them to reach their full potential through the academic excellence that is offered at both Elmhurst College and Triton College,” said Elmhurst College President Troy D. VanAken. To learn more about the 2+2 articulation agreement, contact Brian Pollastrini at brian.pollastrini@elmhurst.edu or (630) 617-3097.